Scott's of Wisconsin means a lot of things to a lot of different people. To some we are a comfort food; to others we are a healthy, nutritious snack; for organizations we offer a fantastic, quality fundraising product; and retailers know they can count on our products to bring their customers back again, looking for our fresh Wisconsin cheeses. With that in mind, our facility needs to be very diversified and capable of handling our products in a variety of ways. We put a lot of energy into developing a facility that gives you exactly what you want and that will serve our needs today and well into the future. Frankly, we are quite proud of the Scott's of Wisconsin Cheese Facility and we've listed just a few of the reasons why below. Relying on universal container types and sizes make our facility run more smoothly, it also gives you an easy reference point to quickly identify our familiar dairy products. 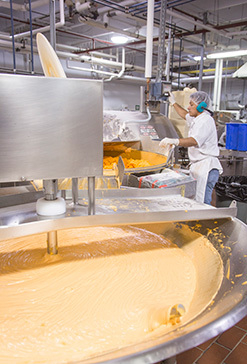 The level of efficiency, flexibility and high quality products that the Scott's of Wisconsin cheese facility produces is vital to our positive impact on the Wisconsin cheese industry and it is one of our top priorities.